Local officials in New York's Long Island say they have removed unauthorised vending machines dispensing drug paraphernalia. The machines allegedly contained glass pipes and filters intended for smoking crack cocaine disguised as pens. The officials said the machines were embedded in concrete without permission in public locations. They said three had been found and encouraged locals to continue to report any more. 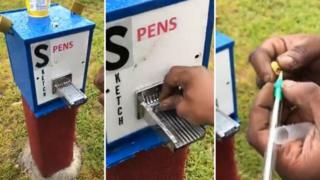 The machines required residents to insert $2 (£1.50) in quarters to dispense a product and were labelled with "pen", "s-pen" or "sketch pen". It is believed they could have been modified tampon dispensers, The New York Post reports. "You think you've heard of everything, I continue to be surprised by some of the audacity of those that would break the law in promoting drugs and drug paraphernalia," Edward Romaine, town supervisor of Brookhaven, Suffolk County, told the media. He said some parents in the area had initially believed the dispensers were supplying pens for the start of a new school year, but a fire official had notified town staff otherwise. A video of one of the vending machines was posted on social media earlier this week by a local resident. Scott Malz told local media he had filmed and shared the video because he wanted the community "to see what was going on to see what was going on and try to get rid of it as quick as possible" because of the area's drug problem.